Does a break at a health retreat sound like hard work? Devoting your holiday time to intensive workouts and bland, punishing diets may not sound like your cup of herbal tea. So it may surprise you to discover most people’s experience at a health retreat is quite the opposite. Must I Take Part in a Gruelling Exercise Regimes? Will I be Forced to Get up at the Crack of Dawn? Will a Detox Suit Me? I’m not the Virtuous Type. Is a Health Retreat for Me? 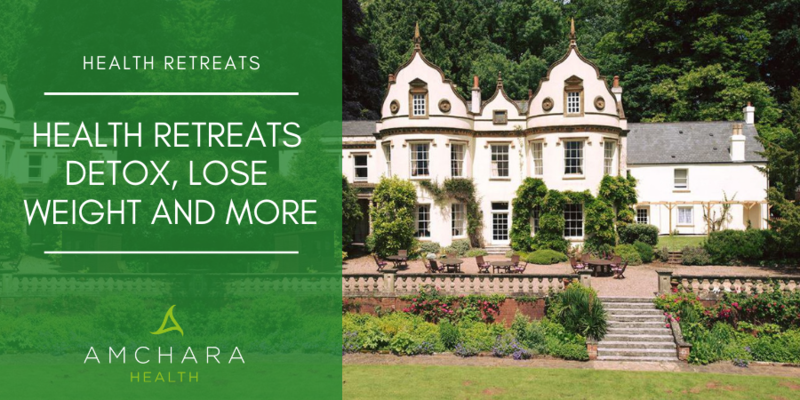 When you could benefit from a recharge of your physical and emotional health, a healthy detox retreat could be just what you need. We’re all familiar with the concept of rebooting our phones or our computers – giving them even a tiny amount of time out works wonders. An opportunity to take five from our daily routine, combining headspace with nutritious food can leave us with benefits which far outlast our holiday tan. How long is it since you devoted even a day solely to yourself? Too long? The beauty of a retreat is time out is part of the deal. Usually, retreats are set in luxurious, calming environments, surrounding you with nature and serenity. It all adds up to a well-earned treat for your mind, body and soul. Freed from the distractions of normal life, your body will thank you for the opportunity to completely relax. 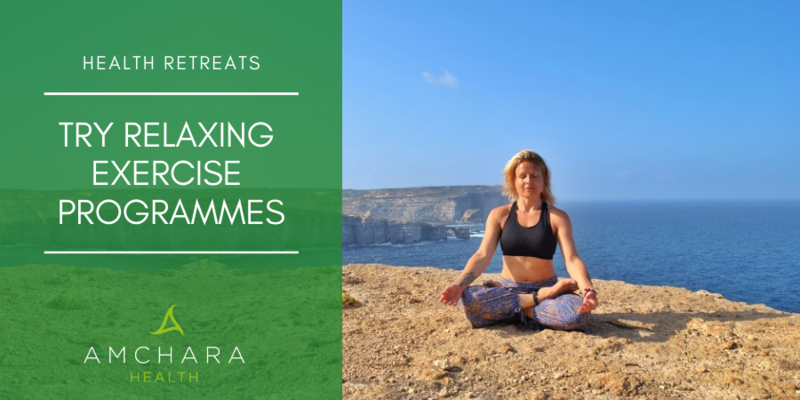 Combine relaxation with healing therapies and classes and a cleansing diet, and you’ll not only end up de-stressed, you’ll go home revived and eager to make time in your life for the good habits you’ve adopted. Let’s find out what a health retreat is really like with these 7 myth-busting tips. 1. Will I have to starve? A typical health retreat will offer you a range of delicious healthy eating options, from raw foods and plant-based vegan eating to juice fasts, super smoothies and raw soups, all prepared by a new breed of therapeutic chefs. A retreat which operates on the concept of personalised health will ensure everyone’s retreat journey will be unique to them. Each person’s custom-made eating plan will be different depending on their health goals. If your goal is to detox, a juice fast may be recommended, or a combination of raw foods and tasty juices, such as beetroot, carrot, celery and cucumber. These are combined with health-boosting natural supplements like spirulina, turmeric and wheatgrass, all designed to support and complement the juice programme. The nourishing yet delicious eating plans are all designed to cleanse your mind and body, restore good digestive health and leave you feeling revived and full of energy. It’s easy to fall into less than ideal eating habits when we’re juggling a busy life. Giving your body a break from caffeine, sugar and processed foods mean it has an opportunity to heal itself. Yet the emphasis is most definitely not on denial. You’ll experience new taste sensations, textures and recipes, many of which I guarantee you’ll want to take home with you and incorporate into your daily life. Most people are pleasantly surprised how few hunger pangs they feel, even on a juice fast, and the majority of clients report feeling clear-headed and full of energy. 2. Must I Take Part in a Gruelling Exercise Regimes? If moving more has been on your to-do list, but you never seem to get around to it, a health retreat is a perfect way to start. On offer are low intensity, simple and relaxing exercise programmes like Pilates and yoga. These will encourage your body to move, stretch and relax at a pace suited to you. Yoga is well known as a great stress reliever, but it can also improve strength, flexibility and promote mindfulness. Science has discovered yoga also reduces inflammation in the body. It does this by depleting the levels of specific pro-inflammatory molecules and boosting the release of anti-inflammatory ones (1). One great benefit of a wellness retreat is the chance to cycle or walk around the beautiful retreat surroundings. This way exercise can fit in naturally to your day. A lasting advantage is you’ll pick up useful tips to help you stay active once you leave the retreat. 3. Will I be Forced to Get up at the Crack of Dawn? Your retreat experience is tailored specifically to you. If you’re an early bird, there will be plenty to enjoy, from walks in nature to yoga sessions, but if snoozing is your thing, then that is just fine too. Each one of us has our preferred way of relaxing, and our unique body will have its own way of healing, too. Some people find they sleep much longer and more deeply while on a retreat, others find they’re leaping out of bed full of beans. Whatever you do - it’s up to you. 4. Will I be Bored? Not likely. There will be a full range of activities throughout the day for you to choose from – if you wish. From inspiring talks on health-related topics to raw food cookery demonstrations to walks around the surrounding natural environment. There will be a tempting menu of both indulgent and therapeutic massages, energising or relaxing yoga, classes and workshops as well as nutritional coaching, emotional freedom technique and meditation. One of the major advantages of a health retreat is the chance to explore the beautiful natural landscape around you. It may be the picturesque English countryside filled with rolling hills and magical local woodlands to explore or the serene beauty of a tiny Mediterranean island with year-round sunshine. Trips to local beaches and villages are organised regularly. There’ll be an inviting pool to enjoy, and you’ll have your own beautiful room to relax and make the most of your me-time. 5. Will I Feel Grotty? The idea behind a detox is to allow your body the chance to eliminate toxins from daily life which have built up in our bodies over the years. A toxin is any substance which can damage our cells. It’s virtually impossible to avoid toxins – they’re in the food we eat, however healthy our diet, the air we breathe and the products we use on our skin and in our houses. Our bodies constantly detox all sorts of substances every second. We have developed systems to do this. However, when toxins accumulate in the body, the result can be health problems like digestive problems, poor energy, low immune system, hormone imbalance and a foggy head. The aims of any detox programme will be twofold - to reduce the number of toxins taken in through the diet and environment, and to provide the body with plenty of nutrients known to support our detoxification processes. The liver is the main organ responsible for detoxification. It processes nasties in two stages, often producing an intermediate chemical after the first stage which is actually more toxic than the original substance. This chemical is neutralised during the second stage of liver detox. So if the second stage lags behind, these intermediate chemicals can build up and harm our tissues. A detox will probably bring to mind an array of unpleasant symptoms, from headaches to spotty skin to aches and pains. They’re caused when the second stage of detoxification in your liver can’t keep pace with the speed toxins are liberated. These side-effects are the major reason people don’t stick to detox regimes after the first day or two, as it’s hard to combine work or social commitments with feeling lousy. 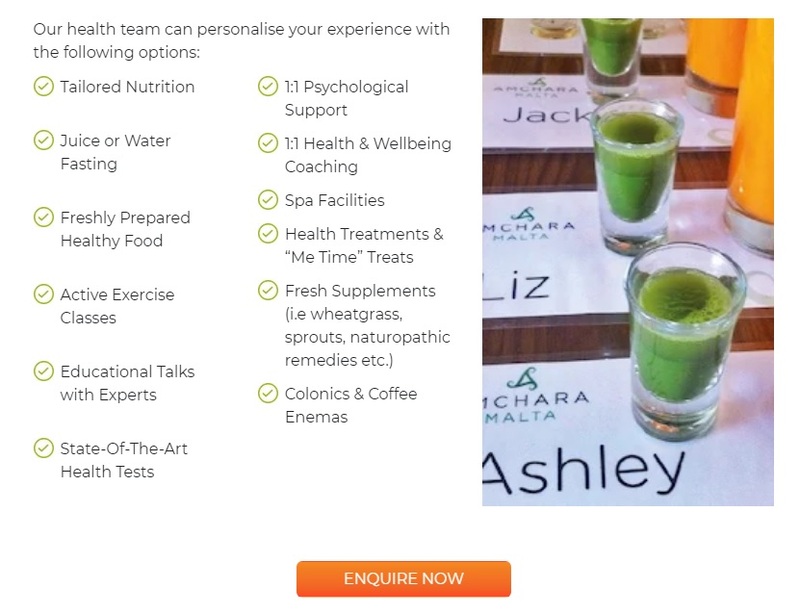 At a health retreat, your nutrition plan will provide your body with nutrients specially selected for their ability to support this second stage of detoxification, with the aim of reducing detox symptoms or eliminating them completely. You can also schedule in techniques to boost your body’s ability to expel toxins into the outside world. Massage, particularly lymphatic drainage massage, can be beneficial. The lymph system is an important part of our ability to expel toxins. It has no muscles of its own, and it can become sluggish, particularly if we’re in a sedentary job. Massage can encourage a lethargic lymph system to move and so drain off toxins. The digestive system can be given a helping hand with colonics and coffee enemas. These are designed to clean the large intestine of the build-up of waste material which can coat the walls of the colon. It’s caused when the waste in our colon travels along too slowly. Most of us aren’t aware we’re carrying around this rubbish dump inside us, but it can cause digestive problems such as bloating, pain and inflammation of the digestive system, as well as adding to our toxic load. Colonic irrigation has been safely used for hundreds of years. During a colonic, pure water is used to rinse out your colon and so remove the built-up debris and toxins. It’s similar an enema but uses much more water. Most clients report a colonic is surprisingly relaxing. If this doesn’t sound like your cup of tea, then you can always sweat out your toxins in the steam room or far-infra-red sauna. 6. Will a Detox Suit Me? The beauty of a functional medicine approach is its concept of personalised health. This means any healing plan – based as it is on a mixture of diet, stress-busting techniques and body/mind therapies – will be as unique as you are. This is why even before you arrive at a health retreat, you’ll have an initial health screening by a doctor and this will be followed up by a personalised 1 to 1 goal-setting and health screen with a trained therapist once you arrive. 7. I’m not the Virtuous Type. Is a Health Retreat for Me? Don’t worry. All kinds of people enjoy a stay at a health retreat. The goal for some may be breaking bad eating habits and implementing good ones. Others may be looking for head space to work through a personal problem or to come to terms with a change in their lives, while some may be wanting to lose weight. Really, the only common goal is our guests all want something to change. That’s why at Amchara our motto is ‘Change For Good’. Check out our fabulous retreats to see which suits you best. Our health retreats are a brilliant way to help you back on track towards a healthy self. They also make a perfect gift for a loved one.